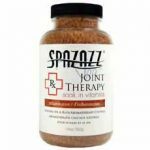 Spazazz RX Joint Therapy Review | Does It Work? Spazazz RX Joint Therapy Review – Is This Product Safe To Use? What is Spazazz RX Joint Therapy? Spazazz RX Joint Therapy is a natural joint care supplement that is touted to improve the overall functioning of joints. The producers insist that the product is made only from natural ingredients making it safe. Spazazz RX Joint Therapy is designed for joints that are no longer functioning as required. This can be due to ailments such as arthritis or due to natural causes such as old age and even due to unnatural causes such as injury. The manufacturer taunts this product to help alleviate the joint related problem by providing lubrication, and the necessary nutrients needed to promote optimal joint functioning. Spazazz RX Joint Therapy is available over the counter without a prescription. What is the Company Behind Spazazz RX Joint Therapy? Spazazz RX Joint Therapy is a dietary supplement that is sold for the care of joints. The producers initially produced this product to be used by people living with arthritis but given its ingredients, this product has been adopted and recommended for aging joints and persons recovering from injuries or surgery. They claim that this product will nourish the body and lubricate the joint to ensure that it is not affected by the leading causes of joint pains; inflammation and dry joints. This product is sold and marketed by Spazazz, a Utah based company. It is not very certain if the same company is the manufacturer. What are the Ingredients Used in Spazazz RX Joint Therapy? Magnesium sulfate – This is a mineral ingredient that has been shown to relieve pain and relax sore muscles. This product has been used for a long time in the joint care industry. Vitamin blend – The assortment of vitamins in Spazazz RX Joint Therapy is believed to help the intake of other ingredients used in this product. Arnica – This contains strong anti-inflammation properties. How Spazazz RX Joint Therapy Works? Spazazz RX Joint Therapy is not like most joint and muscle pain supplements we know. Unlike most of them that are either taken orally or applied topically, Spazazz RX Joint Therapy is used in the bath water. It contains a selected blend of ingredients that are activated by bath water to give you a soothing and relaxing feeling. This method of administering not only utilizes the power of water in the muscles but it activates the skin pores to promote better absorption of the ingredients into the body. This product can be used as often as need be without any harmful effects. What are the Pros of Spazazz RX Joint Therapy? It may help relax and soothe sore muscles. It may help to relax painful joint muscles. It is made from natural ingredients that are no known to irritate the skin or muscles. What are the Cons of Spazazz RX Joint Therapy? It doesn’t give a long term solution to muscle and joint pain. The administration procedure is inconveniencing. The producers have not listed the full list of ingredients. This product comes in crystalline form. This means that it is activated when it is mixed with the bath water or in a bath tub. Simple add Spazazz RX Joint Therapy crystals to your bath water and submerge your body in it for a few minutes. Allow at least ten minutes for the product to be absorbed into the body. By the time of writing, there were no side effects associated with Spazazz RX Joint Therapy. All the same, some people with sensitive skin may experience cracking or drying of the skin. This can be resolved with proper rinsing and apply lotion or jelly to the whole body after the procedure. In case of severe effects, consult your caregiver. Is Spazazz RX Joint Therapy a Scam? Spazazz RX Joint Therapy has been used successfully by a considerable large group of consumers and thus it cannot be regarded as a scam. Spazazz RX Joint Therapy is not your everyday muscle relaxant. It has been proven effective in the soothing of sore and aching muscles. All the same, it is very inconveniencing since not everyone uses a bath tub. Persons who prefer showers or who don’t have the time to soak will find this product extremely inconveniencing.